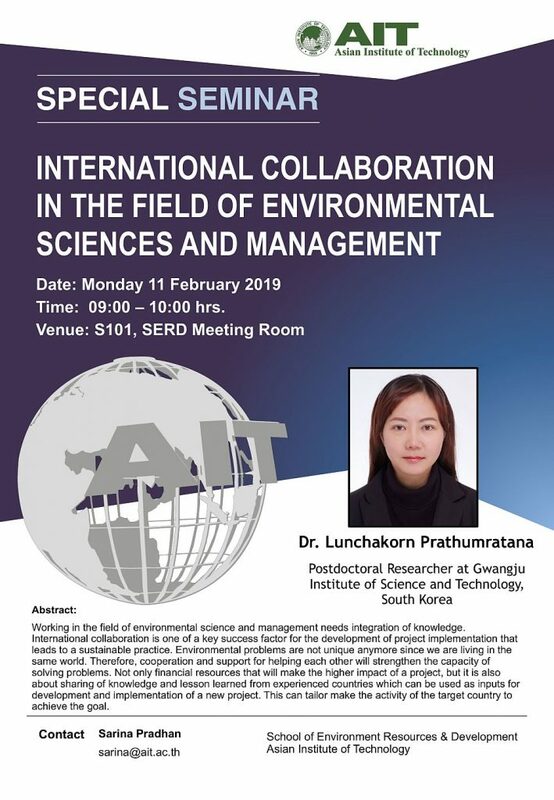 A special seminar on "International Collaboration in the Field of Environmental Sciences and Management" will be delivered by Dr. Lunchakorn Prathumratana on 11 February 2019 from 09:00-10:00 hours in Room S101, School of Environment, Resources and Development. Time: 09:00 - 10:00 hrs. 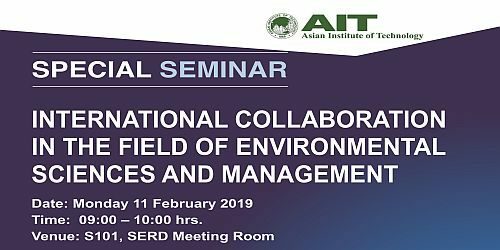 Dr. Lunchakorn Prathumratana is currently working as a postdoctoral researcher at the School of Earth Sciences and Environmental Engineering, Gwangju Institute of Science and Technology (GIST), South Korea, where she earned her PhD. in Environmental Science and Engineering. For the past ten years, she has worked on various international projects relating to environmental sciences, sustainable development, environmental management, and climate change. Working in the field of environmental science and management needs integration of knowledge. International collaboration is one of a key success factor for the development of project implementation that leads to a sustainable practice. Environmental problems are not unique anymore since we are living in the same world. Therefore, cooperation and support for helping each other will strengthen the capacity of solving problems. Not only financial resources that will make the higher impact of a project, but it is also about sharing of knowledge and lesson learned from experienced countries which can be used as inputs for development and implementation of a new project. This can tailor make the activity of the target country to achieve the goal. The presentation includes examples of my past experiences of projects which had been developed and implemented under international collaborations. They were experimental research projects and environmental management projects include ‘Lead contamination of the mining and smelting district in Mitrovica, Kosovo; Sustainable consumption and production (Eco-labels and green public procurement) and climate change; Influence of major and trace elements in soil and grass to Przewalski horses at Hustai National Park, Mongolia; Development of indicators to measure the sustainability levels of mining industries of APEC member countries. Above of all, the transformation of knowledge into practices is challenging, especially when it comes to national levels. I believe that every work in the field of environmental sciences is linked to at least one of the 17 sustainable development goals (SDGs), and cooperation will make them achievable. Registration: Kindly register your participation here to enable us to make better logistics. Please find attached the poster.